Breakfast is at 8:00 AM….early risers may have already been swimming, jogging, biking or fishing under qualified supervision (others roll out of bed at 7:55.) Warm ups and bunk inspection begin at 9:00 AM followed by Olympic event rotations. The morning work out is done in skill ability groups. Tumbling rotations use the 60 foot spring strip, the 40 foot tumble tramp and 30 foot tumble trak. There is an inground pit for vaulting and landings. Many classes are held outside in good weather to take advantage of the Vermont sunshine. There is a well rounded progression curriculum for beginner through Level 9 gymnasts. In the event of a rainy day, an indoor facility complete with a full spring floor and official Olympic equipment is available. Afternoon gymnastic sessions are geared more to individual problem solving, optional tricks, optional routines, or compulsories. Campers may choose gymnastic sessions, waterfront options, or other classes (martial arts, dance, art, cooking, wood working, or photo.) Video taped sessions for immediate feedback and learning are available throughout the day. Opportunities to work on the new compulsories or watch national and international meets are available, as well. Choreography and critiques of choreography by USAG Judges is an option for afternoon rotations. The afternoon ends with a “strength and flexibility” time, with options of yoga, swim conditioning, Zumba, Insanity or more traditional conditioning. 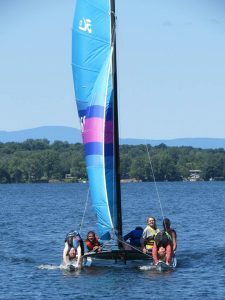 All campers are put onto “teams” for evening activities, which are modified team sports or cooperative group games. With a team name and team cheer the games present some exciting moments to watch! Evening programs vary from guest gymnastic clinic presentations, to counselor demonstrations, judging workshops on an event, to specific event work outs. The conclusion of the day is a “true camp activity,” ranging from a ‘bunk song night’ at the camp fire, a camp fair, casino night, a treasure hunt, an evening dip, to a Vermont night walk…………followed by a bed time snack. Our older campers have a 10:00 PM bed time, with the youngest campers in bed at 9:00 PM. Weekends include a Friday night out of camp adventure, picnics, mini hikes, laundry trips, a quick trip to the mall and informal fun work outs. **Free pick up and delivery to and from the airport or bus station in Burlington is available.